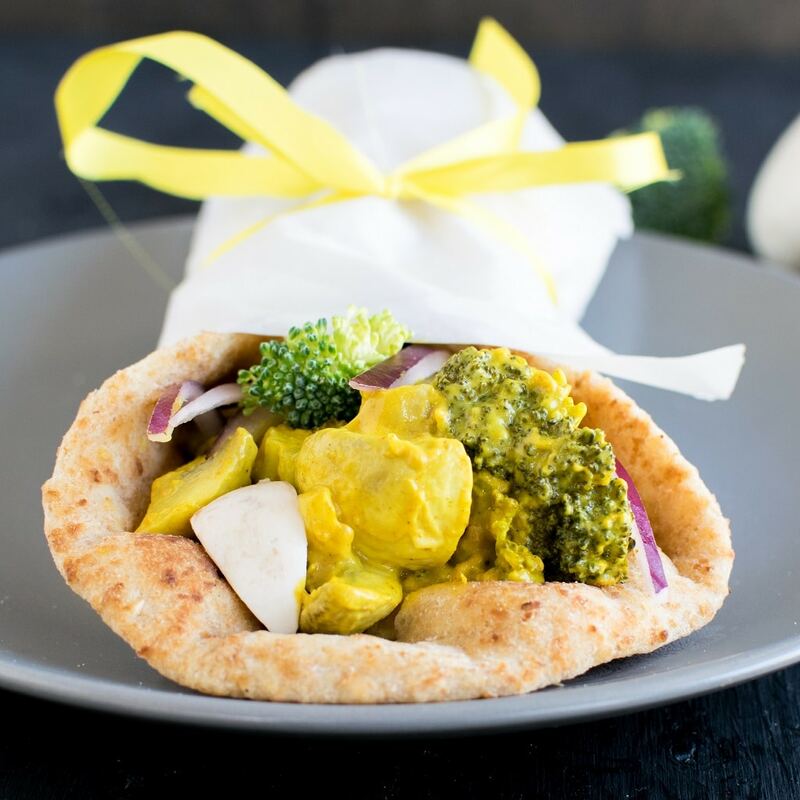 The craveable Tandoori Broccoli Mushroom Wrap is loaded with the goodness of vegetables and is packed with homemade tandoori masala. It’s easy, delicious, satisfying and desirable. 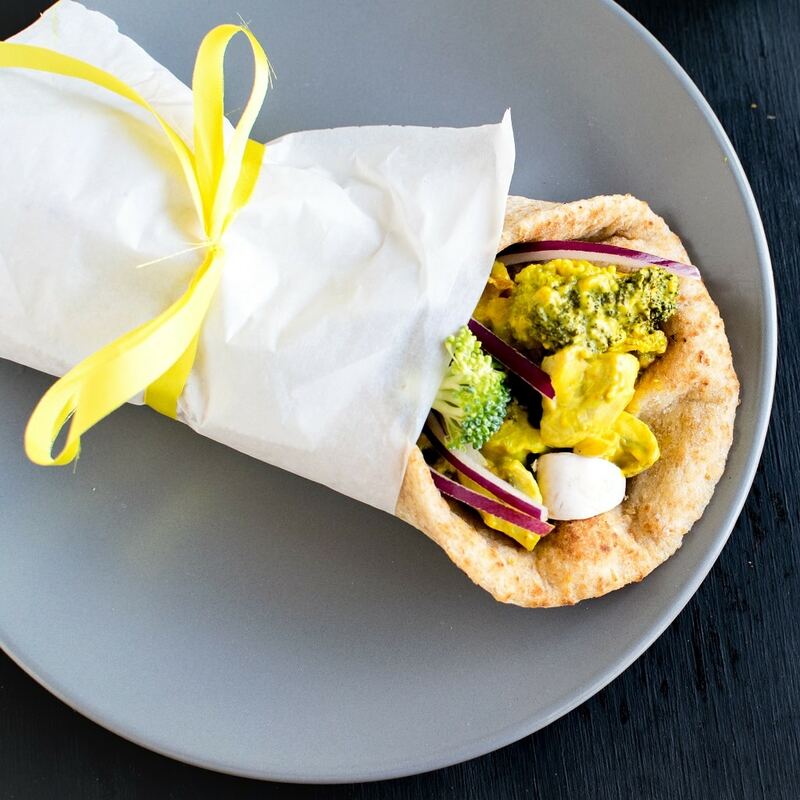 The creamy and tangy stuffing for this wrap is absolutely oil free and made from cashew yogurt or cashewgurt. No baby sitting and no grilling required. 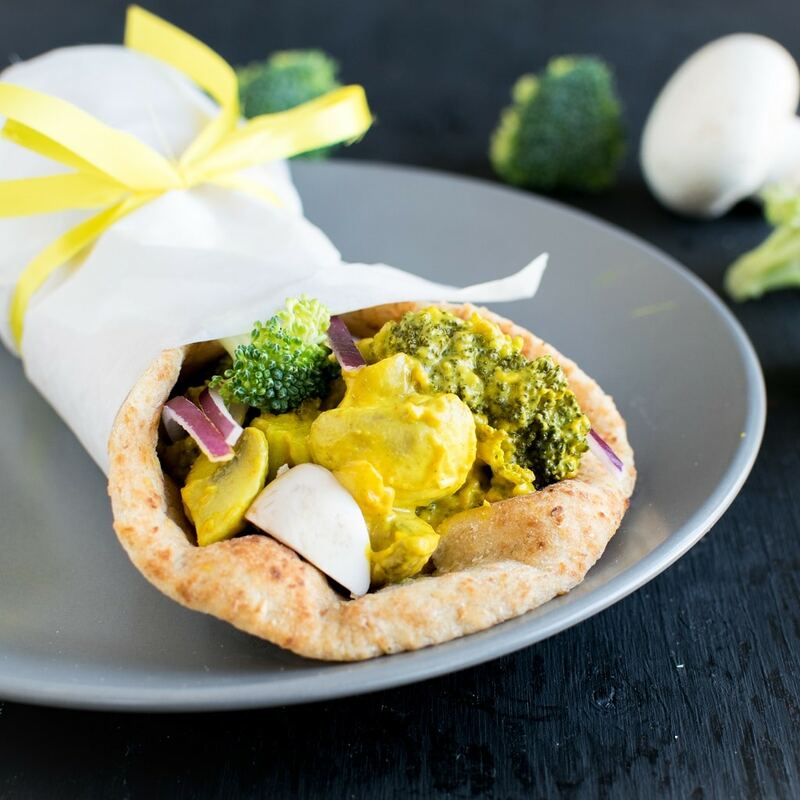 Therefore, this Tandoori Broccoli Mushroom Wrap can be enjoyed in any weather especially in this cold weather. You may happily enjoy this wrap in your cozy and warm blanket or near your fireplace without worrying about any outdoor grilling/BBQ. I love the tangy and the spicy flavor of the stuffing for this wrap. You may use any vegan/regular yogurt of your choice but I chose to use Cashewgurt. It’s basically bland and it not sour at all. It also does not have a taste of its own. So it’s easy to blend cashewgurt in whatever flavor you want. And convert it into any delicious recipe of your choice. However, I have not tried many dishes with it but my experiments are still in progress. In the meantime, I am ready with this aromatic and mouthwatering, not to mention one of my most beautiful dish. Hence, I am sharing Tandoori Broccoli Mushroom Wraps today with its delectable and absolutely desirable flavors. Also leave the marinated vegetables in the room temperature….no need for any refrigeration. It’s simple right? I love this idea of marinating in room temperature. otherwise the cooking time increases in an effort to first bring the dish into the room temperature. Then next making sure it’s cooked evenly. Coming back to the recipe, Later, I heated a pan and greased it with cooking spray so as to avoid the sticking. If you are using a very good quality nonstick pan then you may even skip the greasing part. In the next step, I spread the marinated vegetables on it along with the marinade. Then I let it cook uncovered until the marinade thickens and becomes creamy and vegetables were soft. Lastly, I stuffed the tandoori broccoli mushroom stuffing in whole grain naan bread. My family devoured this wrap endlessly. I personally enjoy eating Tandoori Broccoli Mushroom stuffing with a spoon to exclude some carbs from my diet. However, for gluten free diet you may use gluten free tortillas. Also, feel free to use any flat bread of your choice for this wrap, be it naan/tortilla/pita bread. In a large mixing bowl combine cashewgurt, garlic, ginger powder, coriander powder, chili powder, turmeric powder, cumin powder, cardamom powder, dry mango powder, lemon juice and salt. Whip it well until well blended and no lumps. Now, fold in blanched broccoli and mushrooms. Cover and let it marinate for 30 minutes in the room temperature. Heat and grease it. Pour the marinated broccoli and mushroom along with the marinade. Let it cook uncovered on a low – medium flame until the marinate sauce thickens and is almost absorbed leaving the veggies sticky and thick. Turn off the flame. Place the tortilla/naan/pita bread on a flat surface. 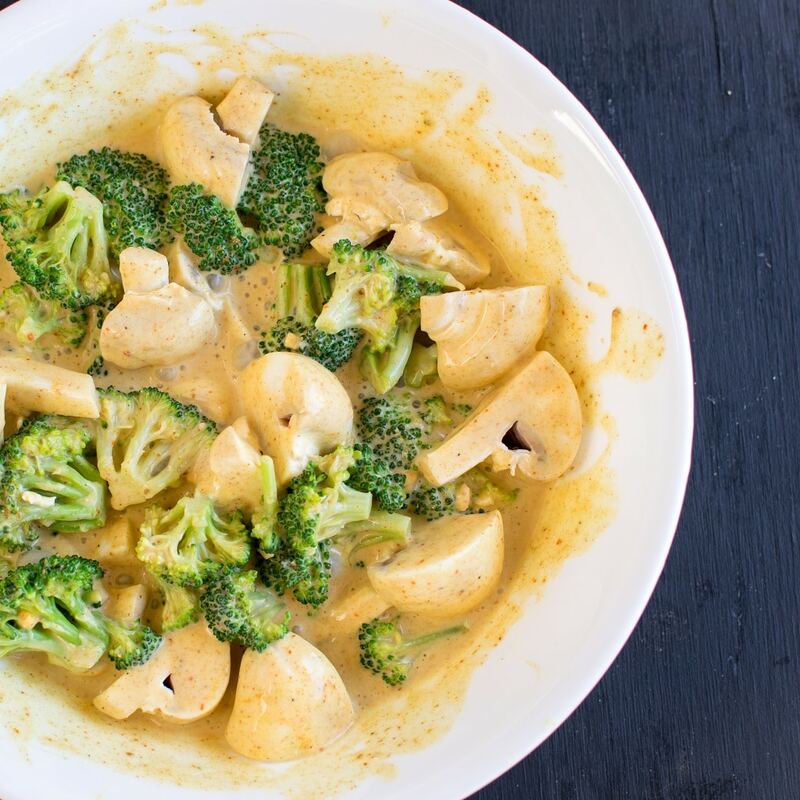 Fill it with the tandoori broccoli and mushroom. Sprinkle some red onion slices and wrap it. Enjoy! I personally prefer warmed/toasted pita or naan. You may use any gluten free or corn tortillas for this recipe. I personally enjoy this without any tortilla and enjoy it as is to exclude carbs from my diet. My family loved it as naan wrap. I used cashewgurt from wholefoods. The taste is quite specific to this recipe. However, if you are unable to find cashewgurt then you may use any vegan/regular yogurt of your choice. In that case adjust the lemon juice if your yogurt is tangy enough and may skip dry mango powder if desired. The nutritional information of this recipe excludes the flat bread. The nutrition will vary depending on the type of flat bread you chose to use. 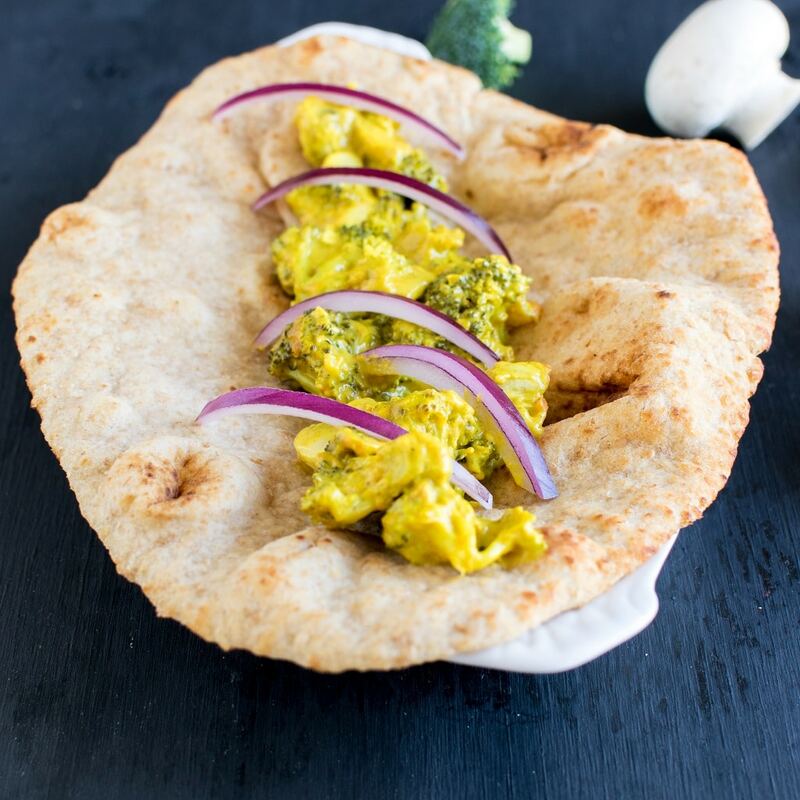 Ooooh we love tandoori flavors – what a great, healthy version with the broccoli. My family will love this!